Five minutes of new spring in my garden. I’m doing several different experiments with the tomato crop this year. I just can’t help myself. Each year I try something new and each year I learn something. Meanwhile we always get a ton of tomatoes, so it doesn’t hurt my bottom line. And I want to get ever more efficient at growing this crop. I’ve got about 60 tomatoes and 20 hot peppers out in the ‘greenhouse’ at the moment, and another tray of about 20 more tomatoes and 20 more peppers under lights in my bedroom. The ones in the greenhouse are doing fine. We have nice sunny days, and I open the door of the greenhouse in the middle part of the day (if I’m home) and allow the plants to get beautiful solar radiation, then close it up about 3 pm and let the greenhouse heat up inside before chilly night comes (between 45-49 degrees outside generally, but much, much warmer in the greenhouse). So that is one experiment - I wanted to see if I could minimize the time and space that seedlings take up in the house (our house is so tiny, even one table full of seedlings is in the way), and I think this is working. Since I don’t intend on putting tomatoes in the ground until the nights are solidly above 50 degrees, we’ve got a while. Also the soil is still fairly cool. I’m hoping not to pot them up further, just plop them into the ground when conditions are right. The tomatoes will go on the south side of the garden this year, in six raised beds. Two of the beds are 4x4 and four are 4x8. This limits me to 40 tomatoes. Eight cherry tomato plants (4 in each) will go in the 4x4s. 16 each of paste and slicers will go in the remaining 4x8s (8 in each). And this planting is where some other experiments are going to come in. I was not pleased with the health and production of my cherry tomatoes last year. I pruned them to a single stem, the same way I did all the others, and it severely limited our crop. We love to have the cherries for fresh eating and quick salads, and we really missed having a lot of them. They are also generally the first to ripen in June, which bridges the gap for us until July when the bigger guys are ready to eat. I’ve done some research, and there is some evidence that pruning cherry tomatoes really limits production. So I’m not going to prune them this year. Tom will make a sort of wooden cage to hold them all upright and contained, and we’ll let them go wild. I’ll still prune the bigger tomatoes to a single stem. However that leaves the soil quite bare, and I don’t have homemade straw this year (I didn’t grow wheat or oats this winter), so at first I was just thinking about how I could creatively mulch the ground around them. And then I was like, wait, why am I not just planting other plants to fill in that space? I mean, I intercrop everything else (grow various types of crops together, or a crop with a cover crop, etc). Why not tomatoes? So I did a little research on that topic, too. There’s not a lot of real science about growing other crops with tomatoes. I think farmers don’t do it much because tomatoes need a lot of air and light to avoid disease; that’s why we prune them in the first place, to remove vegetation to provide more air and light. And that’s super important in a humid location. But - not so much here in summer-dry California where all irrigation is applied at the drip line. I remove those extra branches for a different reason - because I want fruit, not leaves! And bigger fruit at that! So why not replace those bottom branches with a different plant, one that shades the soil, crowds out weeds, retains moisture, and feeds soil life? As long as the plants have a different kind of root system, they shouldn’t compete too much. And I’m not talking about, like, companion plants or something. Companion planting is a nice idea but not exactly science. I’m talking intercropping. Getting two crops out of the same space. Or, even cover cropping, which simply improves the soil. So I’m going to try it. Basil is a natural to put with tomatoes - it has a shallow root system, it likes the same amount of water and heat and light; it stays smaller than tomatoes; it has a beautiful flower that attracts beneficial insects; and it’s something we eat a lot of. I could do basil alone and that would work great. But diversity is good, so how about adding some cilantro to that? 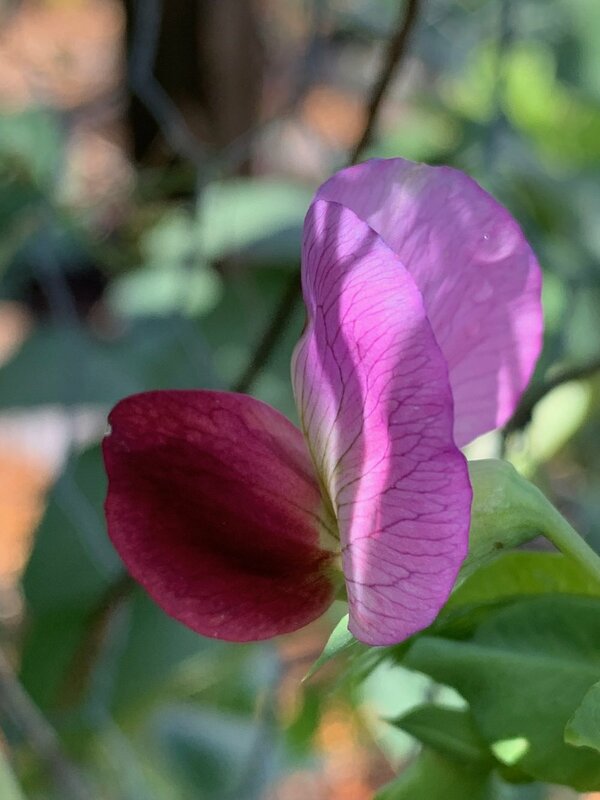 It’ll bolt and re-seed; it adds a new kind of flower for those beneficials; it can be eaten (and we do eat a lot of it); and it looks beautiful. So I could mix those two herbs. I could even mix in a third thing, like cosmos? Purely ornamental, but beautiful and beneficial too. Or I could intercrop buckwheat? That improves the soil and provides a flower for good insects. Or I could mix them all up? I haven’t figured out the particulars just yet, but I’m definitely going to try this method. Have any of you intercropped or cover cropped your tomatoes? If so, please let me know how it went for you! Well, rain yes, but also warming temperatures. This is how the golden hills of California look after a good water year. Like a green velvet carpet. Isn’t it just gorgeous? This is a fleeting event here, as usually by May, everything is brown again. But boy it’s spectacular when we’ve got it. This picture and the next were taken at a State Park called Black Diamond Mines. This area is east of Mt. Diablo and by the delta, where the Sacramento and San Joaquin rivers meet in the furthest reaches of the San Francisco Bay. We used to live out here, by the water, but it added 45 minutes to Tom’s commute and the schools weren’t fabulous, which is why we moved closer to the Bay Area proper. However this park is really wonderful and celebrates the miners who lived here in the 1800’s. They mined both coal and sand here. This picture was taken at the graveyard, full of history, which is up high on one hill surrounding this valley, looking across towards the mines (which were on the right under those trees). I was here for a Geology field trip. A couple of times of year you can go into the mines, where down at the bottom, you can stand inside an active fault! 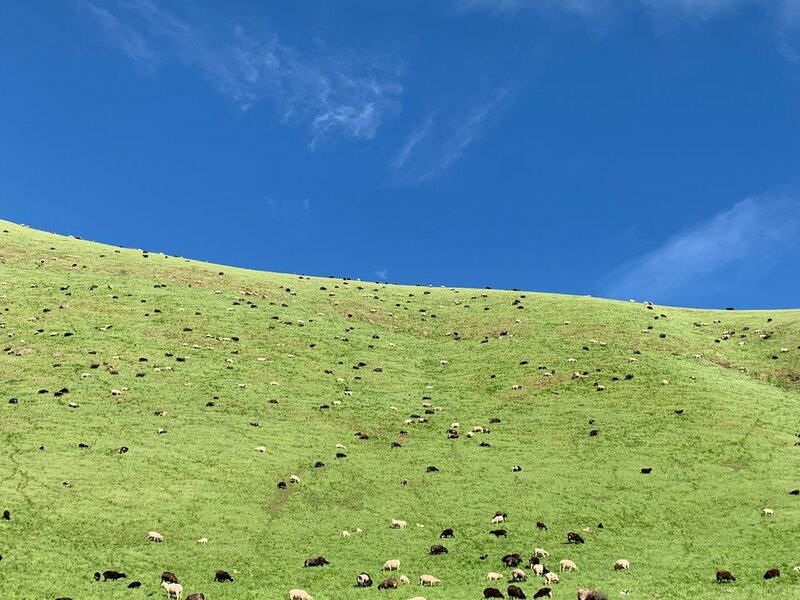 This was the hill above the cemetery, where a local farmer was grazing sheep (a win-win situation - good food for the sheep, fire control for the rest of us). Aren’t those colors glorious? No filters on that picture. It was a perfect day for a walk, albeit a muddy one. Some sun sure feels good after all the gloomy skies and precipitation. And in the garden, I’ve noticed lots of things waking up. So I thought I”d post some pictures of what’s blooming these very late days of winter. true geranium - get a load of the pollen on those stamens! Our roof is being redone today, and it’s crazy and loud and chaotic, but we’re happy it’s getting done, as we had lots of rot. The funny thing is that I signed up for this job back at Christmas. It’s taken this long to get to it, with nearly every day being rainy! So it’s a testimony to some clearer weather. I spent some time outdoors transplanting some precocious tomatoes into bigger soil blocks - once they germinate, they don’t need as much heat or water, so they can move out to the greenhouse which is quite warm at night after absorbing a lot of insolation during the day. The bees are extremely busy bringing in pollen, which means babies are being rapidly born in the hive, increasing the work force for the spring flowers to come. We’ve added room in the hive and will add more this weekend, plus maybe take a bar of honey. 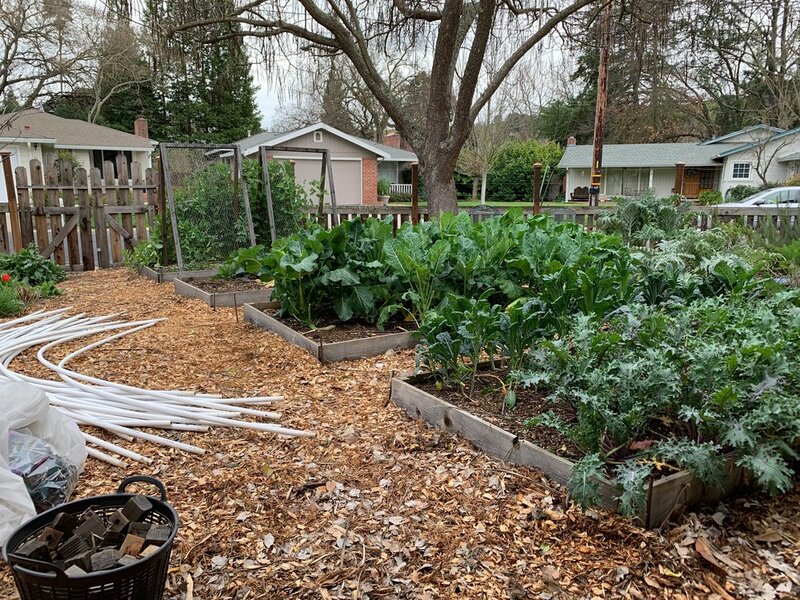 We’ve been eating leaves all winter - spinach, kale, chard, and lettuce - and now our appetites turn to the parts of the plants that take longer to form. Leeks, potatoes, parsnips, carrots - we love all those roots under the earth. And broccoli, cauliflower, cabbage - we love the flower buds (and in cabbage’s case, the rosette of leaves that forms right before the flower stalk). I truly believe that there is no better way to cook these roots and buds than roasting them. So that is precisely what I’m doing today, and this tray of veg will become a base for many meals. Just having the opportunity to go out on a rainy day and prise these roots from the earth, watching the earthworms wriggle away, and smelling that good organic matter smell - well, it’s a privilege to break up the monotony of writing reports and studying for exams with a mosey in the garden. I love watching the flower buds, like broccoli and cauliflower, emerge from the center of the leaves. The garden is beautiful this time of year. It’s also a joy to wash the veg outside and watch the dark earth run away with the water, not having to worry about wasting resources (we’ve had so much rain this year!). Taking the green tops from the roots and giving them to the chickens, taking the chopped-off ends of the veg to the worm bin. Nothing goes to waste. Cutting the roots into fat coins and mixing everything together on an oiled tray. Showering them with salt, sliding them into a hot oven (400-425 ish depending on your oven), and smelling them roasting for the next half hour. Taking them out to toss them a bit, roasting them a few minutes longer (5-15 minutes depending on your oven). There is no better way to taste early spring. Your farmers’ markets will have all of these vegetables in abundance, even in colder areas, as all of these overwinter very well and take some frost, or live in greenhouses or under hoop houses in the snow. Go buy a bunch today if you don’t grow them yourself. Roast them, and use them as a base for your meals: As a side dish with roasted meat, as a bed for fried eggs with runny yolks, as a cold condiment on a sandwich, with greens and a simple yogurt-lemon sauce as a salad, mixed with hot rice or quinoa and a vinaigrette. Endless choices. Soon, the garden will yield garlic scapes, and new peas, and spring onions. Until then, let’s eat our fill of the hearty roots and buds. This has been a big weekend for the garden. Well, honestly the garden itself hasn’t changed much, but a lot of work went in to preparing it for spring and summer. Since it looks like we will no longer be dipping into the 30’s at night, I took off all the row cover and the PVC hoops. It feels great to get all of that gear put away, and leave the beds open to the elements. Everything I planted last October is being eaten now (except garlic and shallots, those won’t be ready for another 2-3 months). Some things, like the Asian and mustard greens, and the Lacinato kale, are starting to form flower heads. 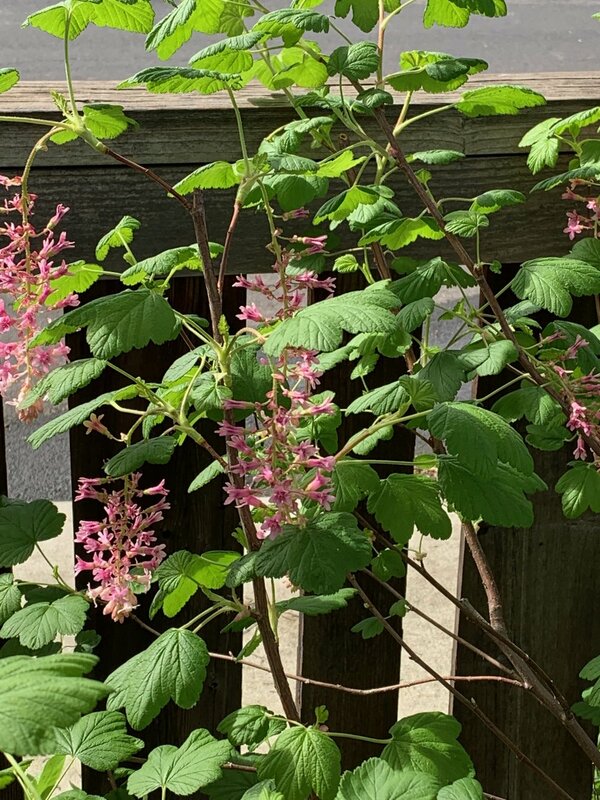 I’ll let them bloom for the bees, and also maybe collect some seed. The broccoli and cauliflower just keep producing, there’s leeks and carrots and parsnips, peas and favas and chard. It’s fabulous. But now it’s time to start thinking about the summer garden! And in that vein, I sowed all my tomatoes and peppers today. I’m planning for about 40 plants of each, but planted twice as much (insurance against something failing) and if I have extras, I’ll give them to friends. One of Adam’s friends has decided to start a small backyard garden and she’s already asked me for a few! That makes me happy, that a young person is getting into growing food. 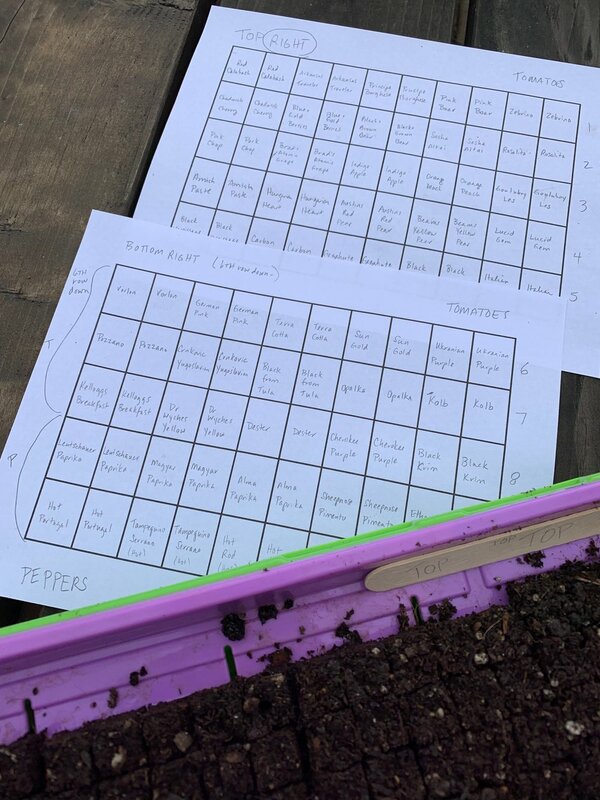 Tom made me a bunch of tiny seed blocks, so I was able to fit several hundred seeds within one seed tray and that limits the amount of heating pads/grow lights/space we need indoors, which is terrific. In about 2-3 weeks, I’ll pot those plugs up into larger seed blocks, and I can avoid using compostable cups (which have their limitations) and I can put them straight into gallons after that. My goal is to get them in the ground in very late April or the first weekend of May. 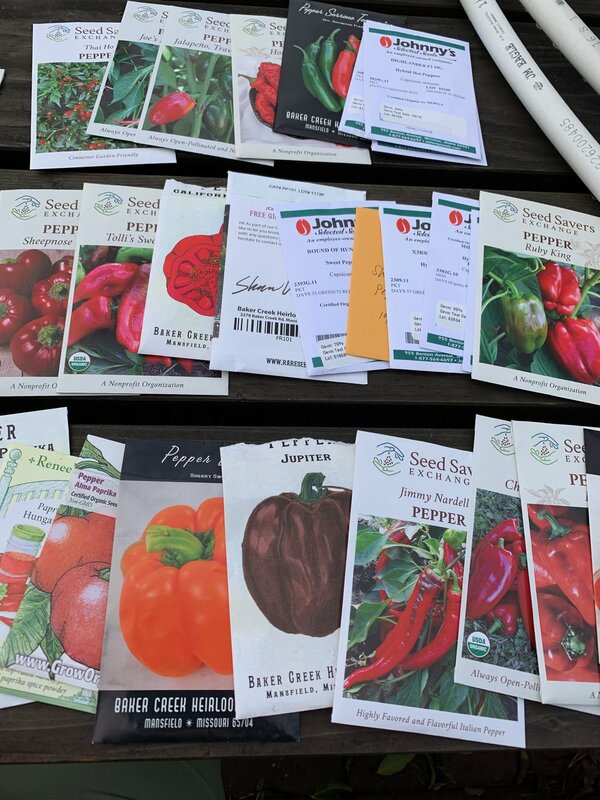 I have mostly seeded old favorites, but I have quite a few new varieties to try as well, many that were given to me by friends. Here’s what I planted. Click on the name to link you to where to purchase (or just to drool at the pictures).